Pemeberton Group chose a unique location adjacent to the lush grounds of the St. Michael's Collage campus if the University of Toronto for their singularly exceptional U Condominiums. Steps from world-class shopping along Bloor Street, Yorkville and Hazelton avenues and in the very heart of Canada's Financial District, U Condominiums offers a lifestyle that is unequalled. It's unquestionably the ideal choice for urbanites who are ready for an ultra-luxurious and sophisticated lifestyle in Toronto's most exciting location. U is for you. 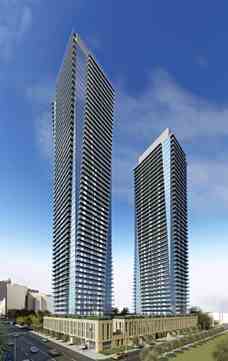 U Condominiums will consist of two residential towers, one 45 storeys and another 55 storeys tall. Pemberton Group chose a unique location adjacent to the lush grounds of the St. Michael’s College campus of the University of Toronto for their exceptional U Condominiums. Each tower is topped with a 4,500 square foot amenities area with a wraparound balcony, framed by amazing views. Entertain in the elegant, well-equipped party room, savour some quiet time in the library with its intriguing architectural feature wall and exercise in style in the bright and spacious fitness room and yoga studio. The unbelievable three-storey lobby (designed by Andrea Kantleberg) features 24-hour concierge service. Steps from world-class shopping along Bloor Street, Yorkville and Hazelton Avenues and in the very heart of Canada’s financial district, U Condominiums offers a lifestyle that is unequalled. It is unquestionably the ideal choice for urbanites who are ready for an ultra-luxurious and sophisticated lifestyle in Toronto’s most exciting location. U Condominiums’ suite designs are characterized by spatial efficiency and an abundance of natural light through expansive windows. The open concept plans are beautifully proportioned and well-balanced. Kitchens feature a generous island for welcome storage. And each suite is graced with a minimum of one large balcony that extends your living space.